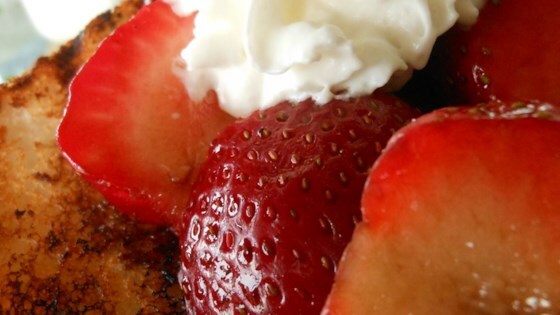 "Here, low-calorie angel food cake picks up the smoke and char of the grill and is topped with strawberries soaked in balsamic vinegar and black pepper, an irresistible combination adored throughout northern Italy." Combine strawberries, balsamic vinegar, sugar, and black pepper in a bowl; marinate for 10 to 15 minutes. Grill the slices of angel food cake on the preheated grill until toasted, 3 to 5 minutes on each side. Transfer the cake to 4 dessert plates and top with marinated strawberries and the liquid and a spoonful of whipped cream. If using a grill pan or nonstick saute pan to toast the angel food cake, add 1 tablespoon butter.